A private residence on Lake McDonald inside Glacier National Park. Enjoy the comfort and privacy of your own cabin with a stunning view of Lake McDonald and the mountains surrounding Going-to-the-Sun Road. 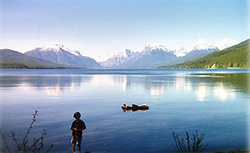 Soak your feet in the lake or walk into Apgar village and enjoy all that the park has to offer. Only minutes from spectacular hiking, world-class golf resorts and wild and scenic rivers. One of the renters last year left the following note, 'Everything was fantastic: the cabin was spotless, all the utensils, linens, books, etc., etc., were more than enough. Suggestions for improvement. don't change a thing. With that view, a tent and a bucket of water would do just fine'. This lovely cedar cabin has 2 bedrooms, one with a queen size bed, one with two twins that can be converted to a king and a fold-out couch in the living room. The hard wood floors, woven rugs, fireplace and cedar furniture complete this cozy retreat. A covered deck extends across the front of the cabin - the perfect place to enjoy the view. The cabin is fully furnished to provide you a comfortable and relaxing vacation. Amenities: fireplace, phone, stereo, full kitchen, microwave, dishwasher, cooking utensils provided, linens provided, washer, dryer, gas grill (BBQ), pets NOT allowed, covered deck. Activities (on site or nearby): hiking, biking, golf, fishing, wildlife viewing, horseback riding, shopping, swimming, diving, boating, white water trips, kayaking, Big Mountain Resort. Directions: A private residence on Lake McDonald inside Glacier National Park. 20 miles from Glacier International Airport.